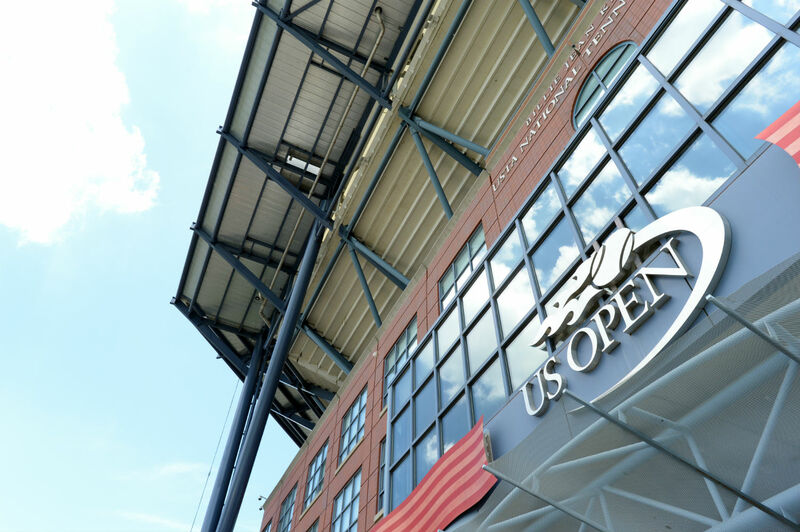 In 2009, the USTA was pessimistic of constructing a roof over the stadium. 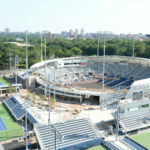 They argued it was hard to justify spending such money on a stadium that was used for only a few weeks a year when the organization’s primary aim was promoting tennis at the grass-roots level. Now, however, in light of Rossetti’s much less costly $100,000 solution the organization has changed its tune. 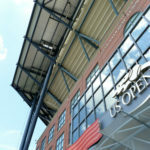 At the unveiling, Smith and Matt Rossetti of Rossetti boasted of how the roof can open or close in under six minutes. This was put to the test only moments later with the roof being fully closed in five minutes and 22 seconds (under this author’s watch). Once complete, there was a marked difference in both light and temperature. 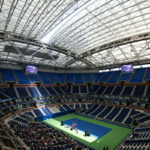 No longer necessary to squint, the PTFE significantly reduced sunlight glare while also drastically cooling the arena. The reopening however, wasn’t quite as smooth. At the third time of asking after Billie Jeane-King beckoned: “Let there be light, again!” the roof finally opened in swift fashion. Smith later used this as a springboard to inform the audience of how the sensory components of the roof require perfect alignment for the structure to move along the track beds that are in place. Courtesy of the engineers on hand, the delay was only a mere ten minutes and Smith was quick to say that the situation of opening and closing in such a quick manner is unlikely to occur – if at all. 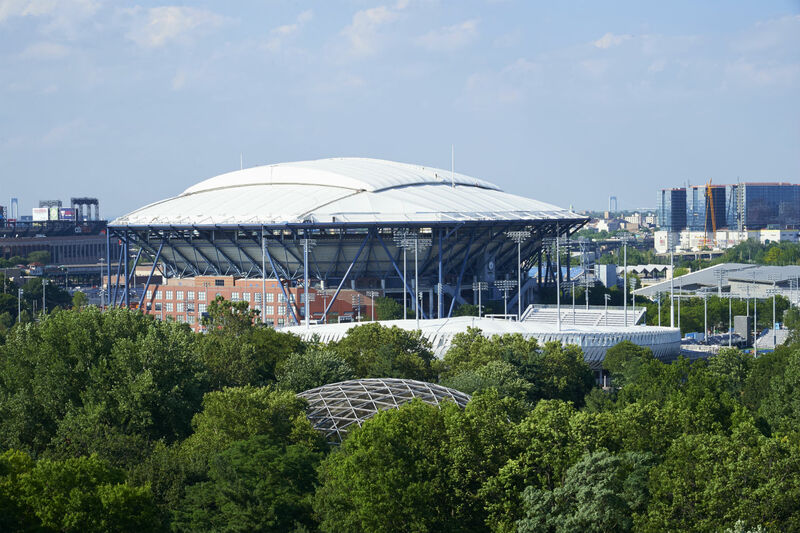 It’s worth noting that the Arthur Ash Stadium, built in 1997, is the largest tennis arena in the world though it was never designed to have a roof of any kind placed on it. 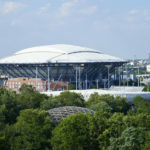 Now though, it is part of an elite group of of a handful of tennis stadia worldwide that can boast a retractable roof, third on the Grand Slam tour to the Rod Laver Arena in Melbourne and Center Court at the Wimbledon Championships in London. 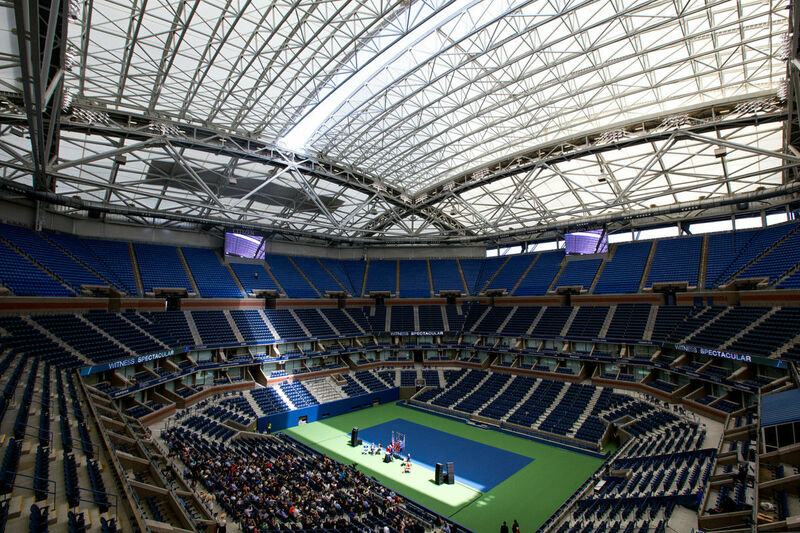 Here, the roof takes a minimum of ten minutes to be fully deployed; conditions are ready for play around a further 20 minutes after. 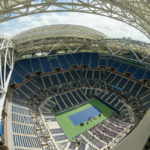 This added delay is mostly due to the fact that Wimbledon uses grass tennis courts in which moisture in the soil can lead to an increase in humidity when the roof is closed, making the ball behave differently. 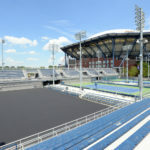 Explaining this to AN, Matt Rossetti pointed out how the U.S. Open uses a hard court system which negates this effect. Play would be able to get underway much more quickly with players barely noticing a difference. Rossetti also responded to questions from AN regarding the new problems a roof would create such as water run-off and climate control. In response to this, Rossetti identified the large metal guttering that traces the perimeter of the roofscape. 15 feet wide and four foot deep, Rossetti recalled how he reacted with shock to the design requirement. “We said no way, something’s got to be wrong!” Rossetti exclaimed regarding the results of the calculations that stipulated such monumental guttering. In terms of maintaining a constant climate, Rossetti also noted the large power unit nearby which will power the the roof system as well as act as a chiller for the space. 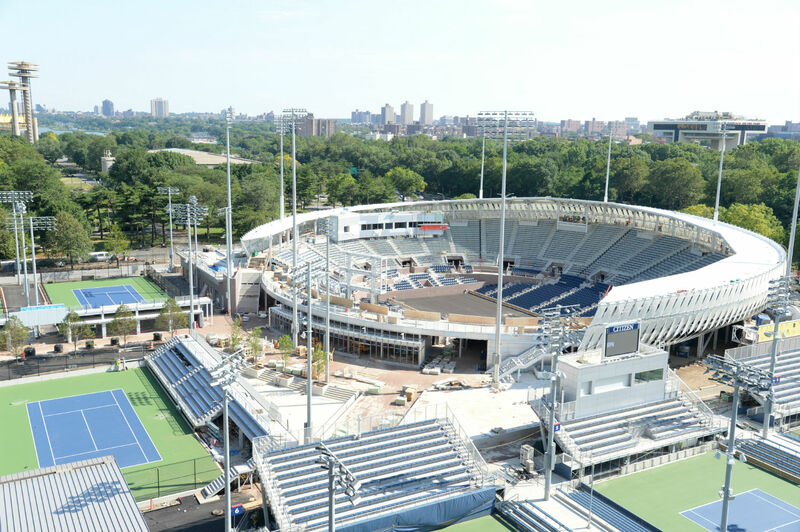 The roof isn’t the only change going on at Flushing Meadows either. 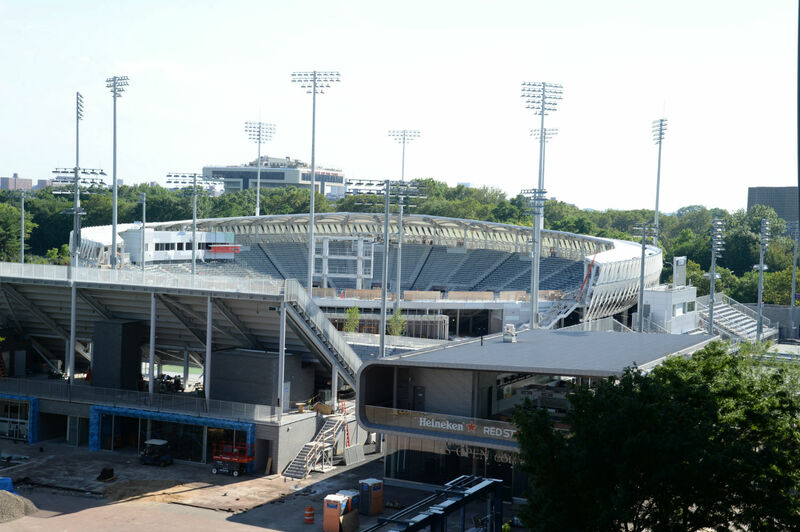 Part of a masterplan from Rossetti, a new Grandstand stadium has been built, replacing the old venue which was famed for its intimate environment. 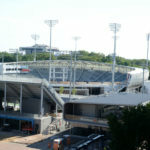 Rossetti iterated how this intimacy has been maintained as a key component of the new stadium’s design. 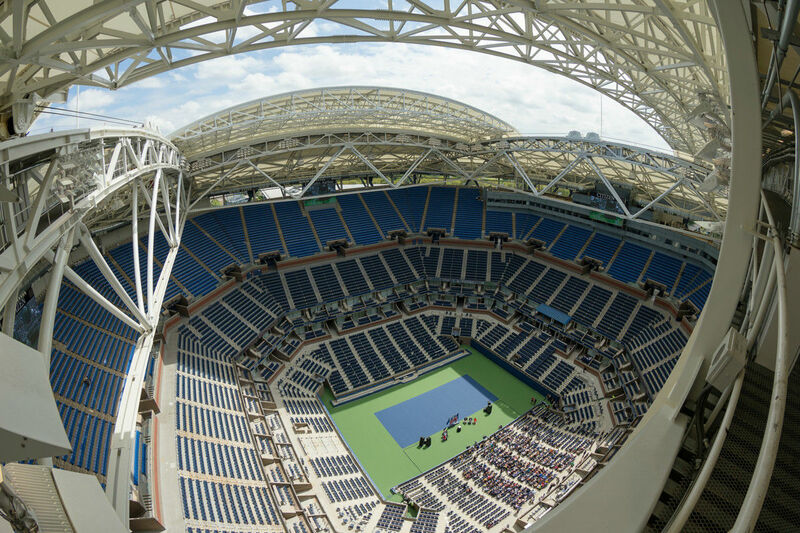 Sunk into the ground, the new 8,000-seat venue uses a PTFE skin to form partial bowl around the arena. 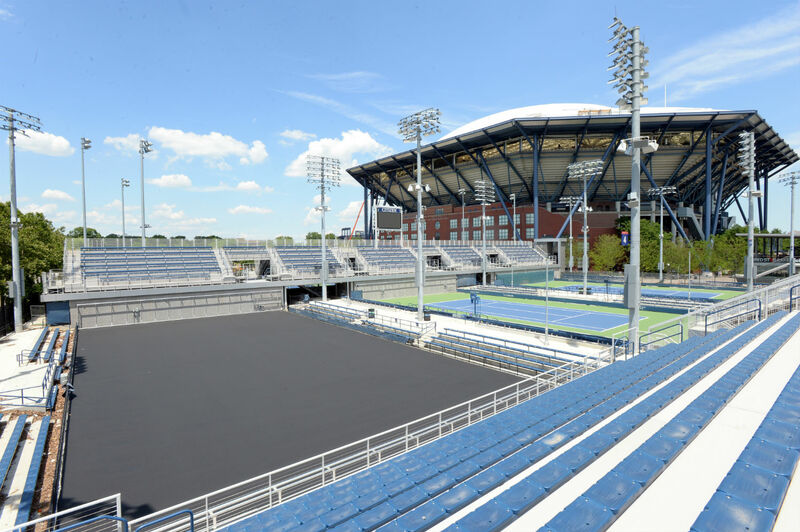 Set against the edge of the nearby Flushing Meadows park, the bowl, which is perforated and broken down into segments, aims to imitate “the view through the foliage” in a similar fashion to the adjacent trees.